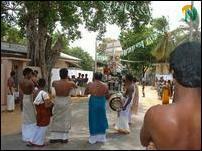 In August and September hindu temple festivals turn Jaffna into a virtual spiritual town. Mavattapuram temple located in the High Security Zone in Keerimalai, Nallur temple, Sellasannithi in Thondamannar are among the most popular temples where the festivals can last for 26 days. 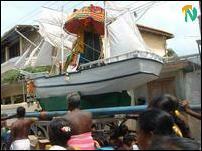 The Sri Lanka Army (SLA) made special provisions for devotees to attend the Car festival ("Ther") and stay overnight for the water cutting ceremony at the Mavattapuram temple, this year. 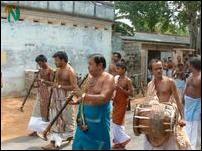 In Valvettiturai, "Kappalodiya Pillaiyar" temple located near the town center, held its water cutting ceremony in the middle of August. During this festival the deity is taken to Oorani shores, a few kilometers east of town, for the water cutting ceremony, and brought back to the temple in a procession. 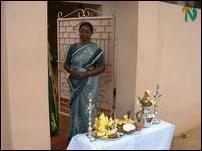 Every household places a table at the entrance with religious artifacts including lamps and vase filled with water. The procession moves slowly through the narrow streets stopping at every house for the priest to perform a short religious ritual. 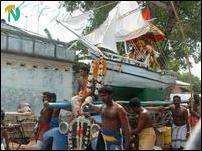 Deity's protection is sought with a visit to the Pillaiyar temple by everyone before he/she ventures out into sea.